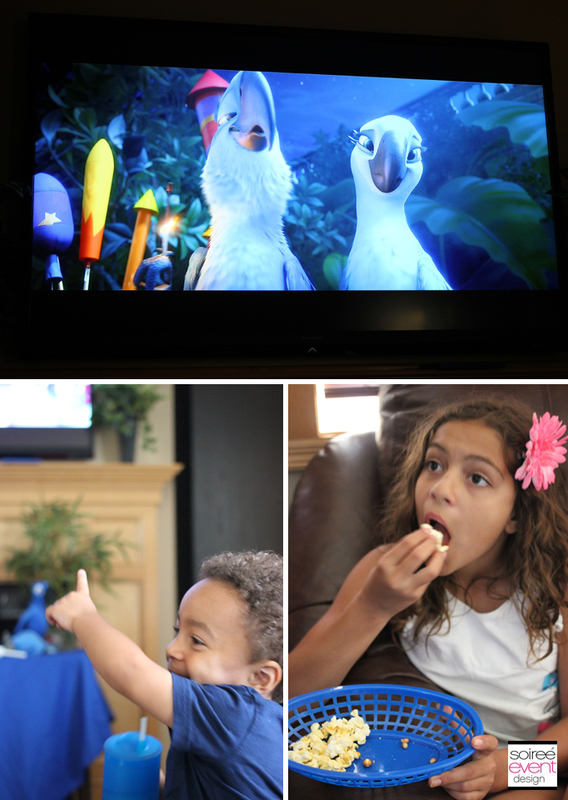 Rio 2 Family Movie Night! Hey party peeps! As a work-from-home “Mom-preneur” summers can be really hard for me with the kids at home and looking to me for things to do every day while I still have a business to run. I don’t know about you but I sometimes feel guilty with the summer passing by each day and the not having lots of extra time to just hang out with my kids. So my family and I came up with “Fun Fridays” which is every Friday through the end of summer where I take off and dedicate that day to do something fun with the kids. 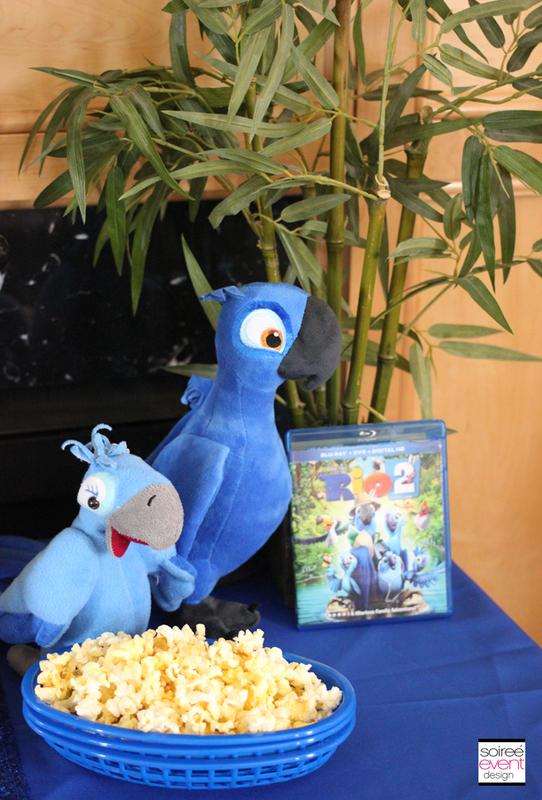 Last Friday we kicked it off with a RIO 2 Family Movie Night! 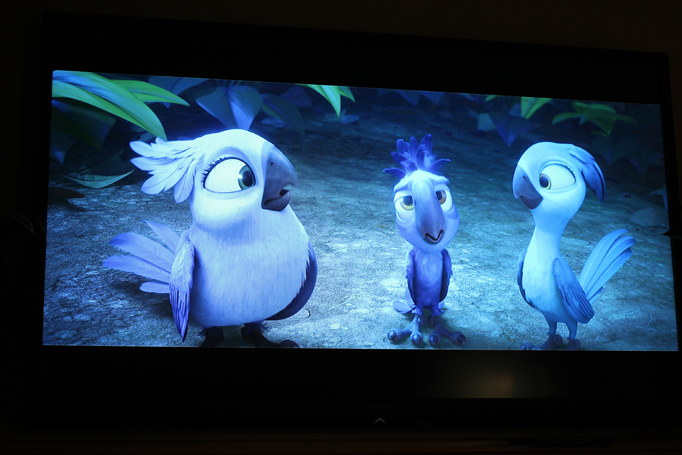 A movie night seemed perfect since the kid’s favorite movie RIO 2 just came out on DVD last week and they have been WAITING for this movie to come out. So, I secretly picked up the movie while shopping in Walmart on Tuesday—the day it released—and picked up their favorite movie snacks—Pop Secret microwave popcorn and boxed movie candy. My kids have movie night with popcorn on their own a few times a week already during the summer, so I wanted to figure out how to make this movie night extra special since it was our first “Fun Friday”. So, I decided to go all out and setup some Rio themed decor and make it a party! Finding decor for our movie night was easy. My kids are HUGE Rio fans. 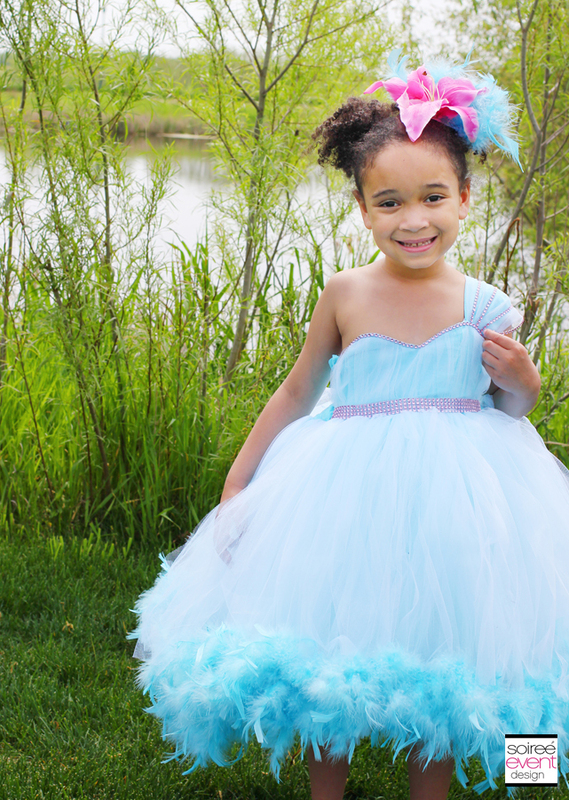 My daughter, Riley had a Rio themed party for her 4th birthday (see it here) and this year, Nevaeh’s Baby Couture made her a custom Rio inspired outfit made to resemble Jewel— her favorite RIO character. Now, my 2 year old son is also a huge RIO fan and they watch the first RIO movie together over and over. We even have the soundtrack on my iPod in the car that we listen to all the time as per the request of my 2 year old Michael! Yes, yes, I admit to knowing EVERY WORD to EVERY SONG on that soundtrack and LOVE IT! Needless to say, finding RIO themed decor wasn’t hard in my house. I simply went and grabbed all their Rio toys from their rooms. Super easy and no money spent! Gotta love that! 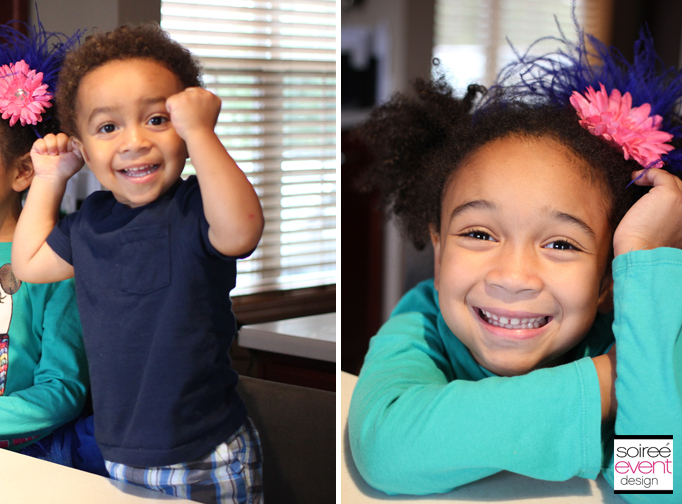 Since Jewel is Riley’s favorite character, I put out pink flower hair clips for us girls to wear for the movie. 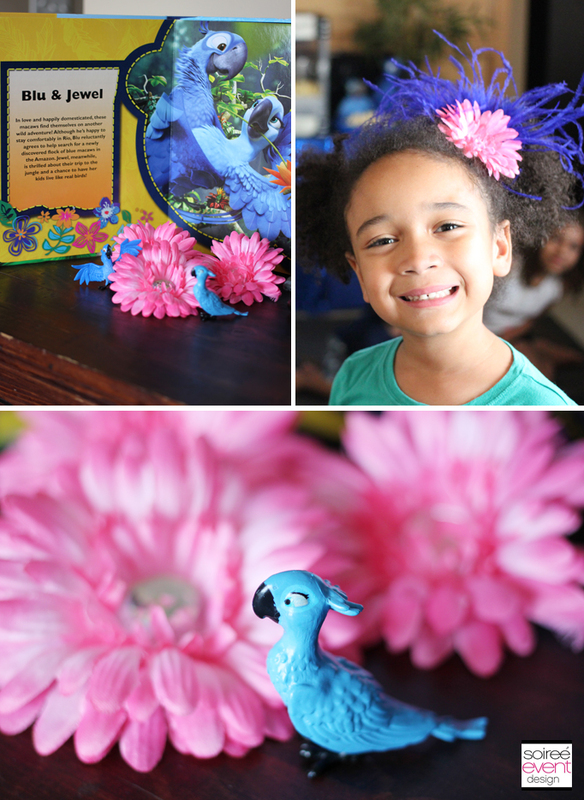 Once I put the flower in her hair, she immediately ran back to her room and came back with her blue tutu and blue feather RIO headpiece that she wore at her 4th birthday party to complete the look! That’s MY daughter! 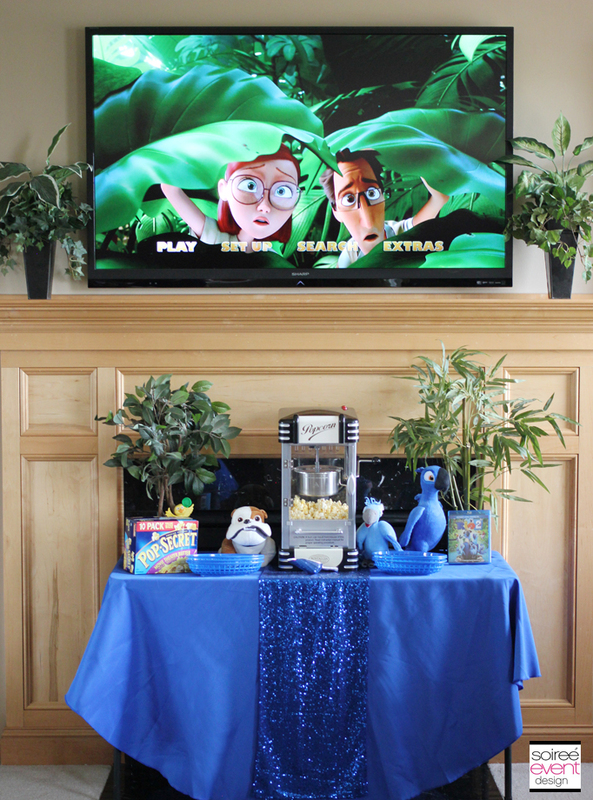 Instead of handing the kids their popcorn in a big bowl to share—like I normally do— I setup a tropical Rio themed popcorn bar under the TV with individual sized blue baskets so everyone had their own popcorn bowl. GIRLFRIEND TIP: We have this cool popcorn machine in our house for decoration. Instead of the mess of actually using it, the kids simply popped a few extra bags of Pop Secret popcorn in our microwave and put it inside the machine so that they could refill their bowls without me or hubby having to get up in the middle of the movie and pop more popcorn. The kids LOVED being able to do this on their own! In fact, they refilled a few times! 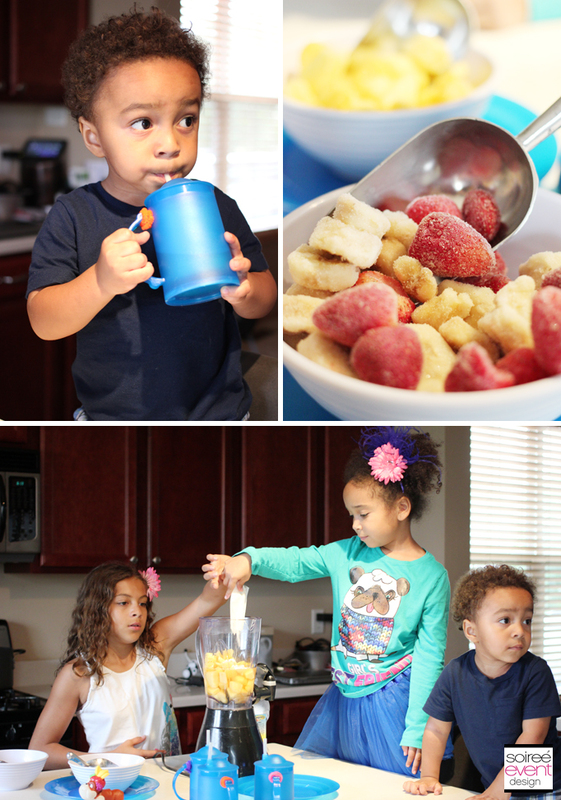 Smoothies are a must have in our house in the summer. The kids were beyond excited to see that I set up a“Luis’ Fruit Smoothies” station so they could make smoothies all by themselves. Faith, my 11 year old, supervised of course and thoroughly enjoyed taking the lead. 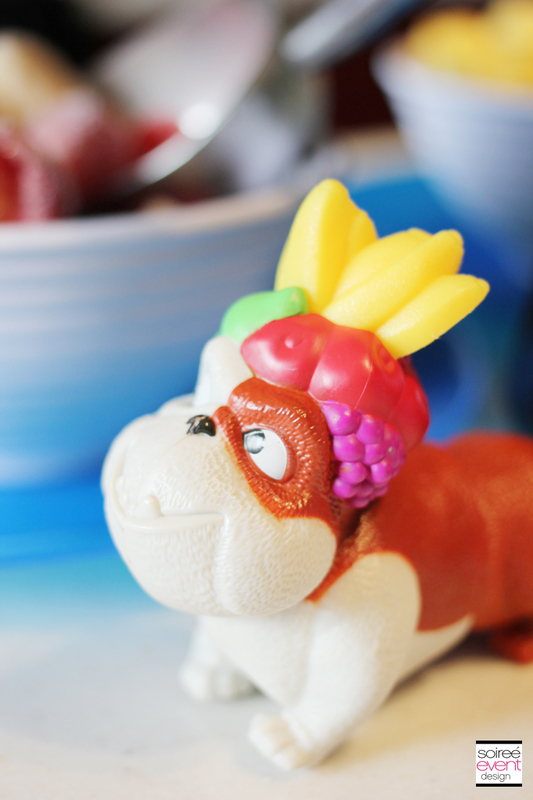 To add decor I placed a Luis toy (how perfect is his fruit hat) next to the blender and pulled out blue freezer cups from my party inventory. GIRLFRIEND TIP: Using these blue freezer cups is great for a movie night. Place them in the freezer an hour before you start your movie to freeze the inner layer and when you’re ready, pour in the smoothies and they will stay cold throughout the entire movie. Since all the cups are identical, we wrapped a different color chenille stem around each of the handles so that the kids could keep track of which cup was theirs. Setting this up literally took maybe a half hour and is so easy for any mom to do using things you already have around your house. 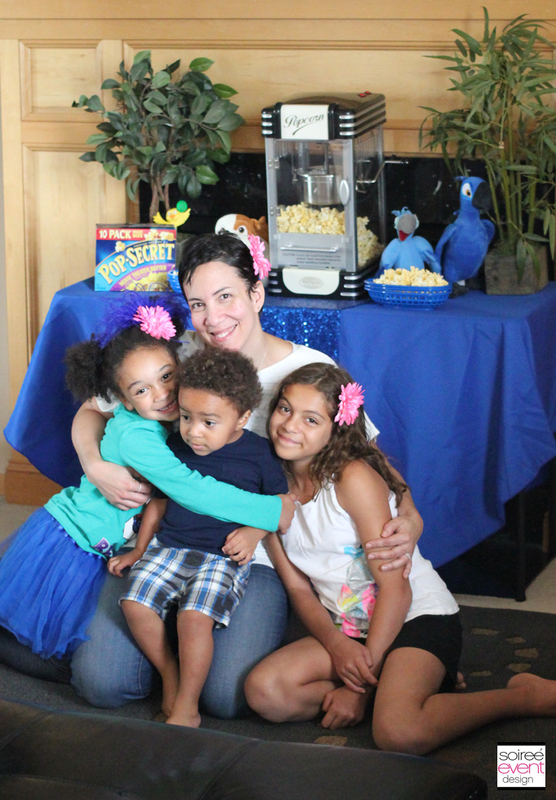 The smiles from the kids’ faces was so worth the extra effort to create this themed family movie night! It didn’t hurt too that the movie was REALLY good…the whole family actually wanted to see it including my husband AND my 18 year old son! The music in the movie was AWESOME and had the ENTIRE family dancing around. Memories we won’t soon forget! Are you planning a movie night for your family? 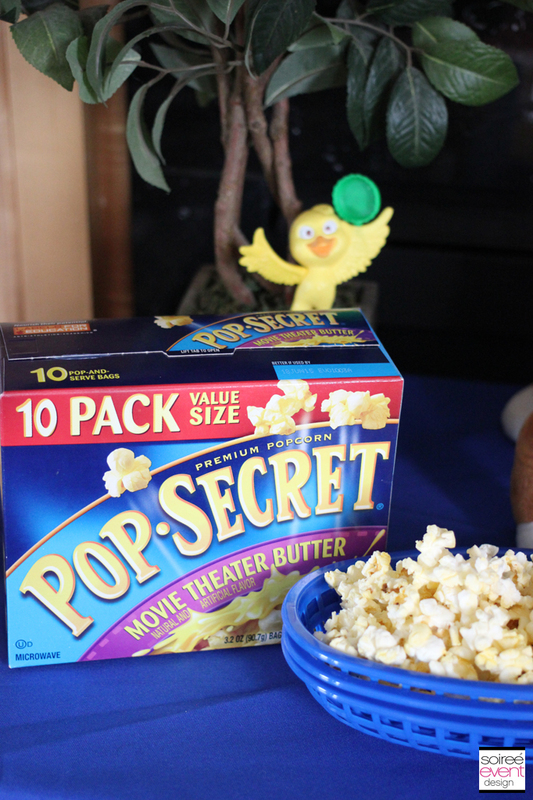 Click here for a $1 off coupon for PopSecret popcorn to get you started (while supplies last). What movie are you planning on watching? This Fun Friday thing is pretty fun…I’m looking forward to seeing what the kids have in store for us this Friday as it is kids’ choice! UH-OH! This really looks fun and easy! I think all ages of my family would love this! This is an awesome idea for any budget!!!! I love how you break everything down…. I’m sure memories like these will stay with your kids forever!!!!! Thanks Karen. Yes, the kids are always excited when me and hubby watch movies with them. This looks like so much fun! I can’t wait to do this….keep the inspiration coming! SO FUN!!! We just saw Rio2 and LOVED it!! What a fun movie night for your family! They will remember this for a long time i’m sure! Cute setup Tonya! thank you for the fun tips that we all can use. 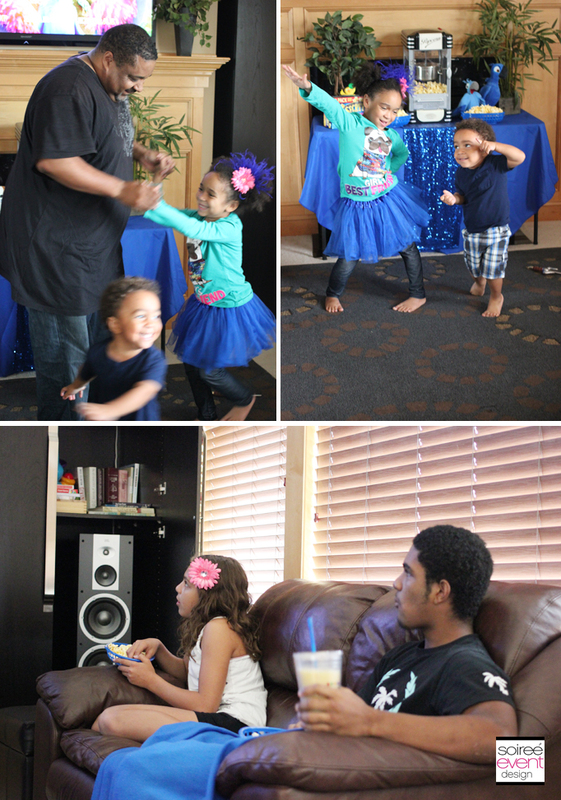 We also had Family Fun night this past Friday and we watched Rio 2, ate pizza and popped some popcorn. Pop Secret popcorn of course! We LOVE our Family Fun nights. We just saw this movie on our cruise and loved it! 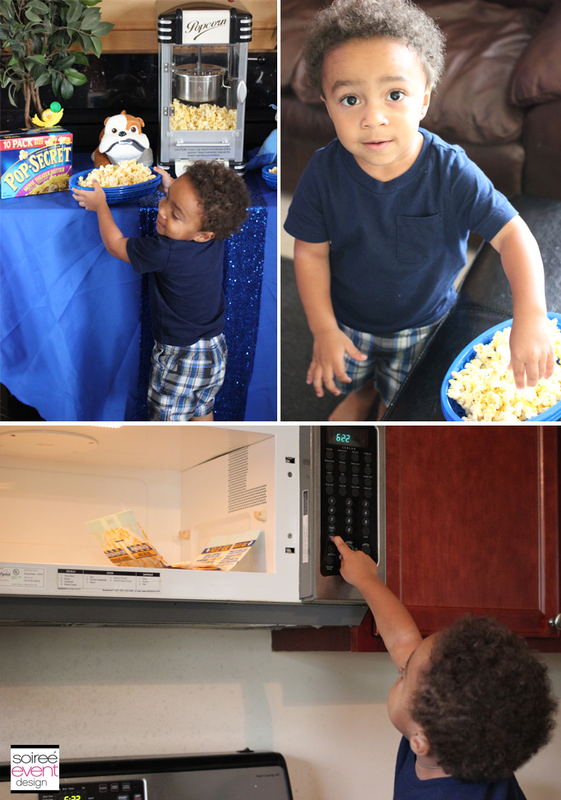 Such a great idea to fill the popcorn machine with pre-popped bags of microwave popcorn, less mess = more fun! Thanks Mariah! 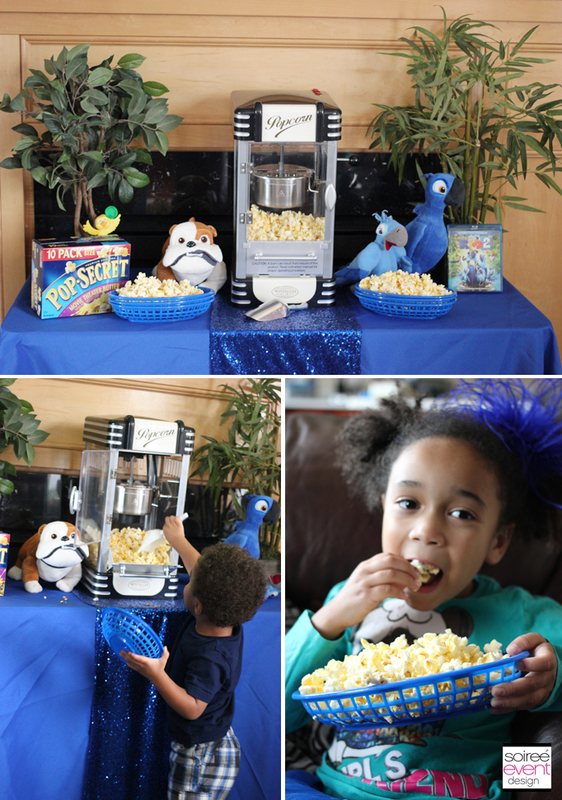 YES, that popcorn machine has been sitting unused since we got it because frankly the kids just love the Pop Secret microwave kind so instead of it sitting there looking great and doing nothing…it became the perfect Prop with a Purpose! You know how we party planners do! Looks Fantastic!!! Everyone looked like they had a GREAT time!!!! We did. Even the hubby broke out and started dancing with the kids! Riley LOVED that!!! I loved the Rio and was thriller when they came out with Rio 2. We have movie and family game night once a week. Normally on Sunday evenings. 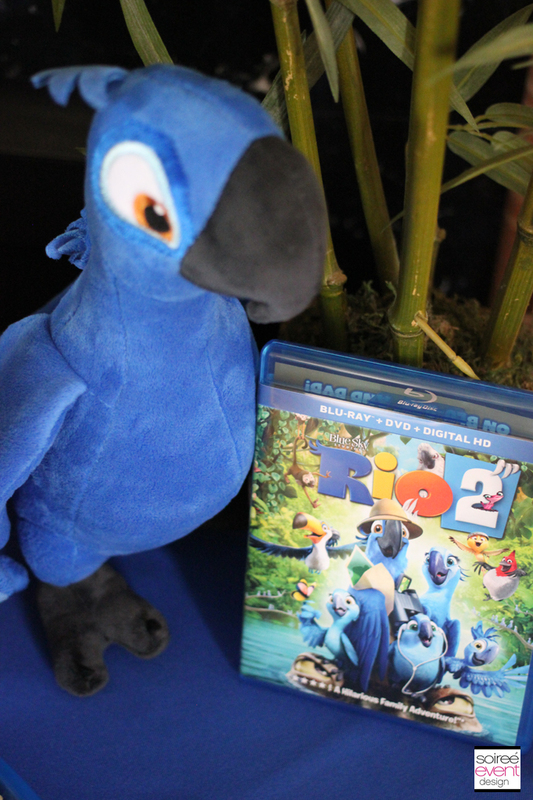 I loved Rio and was thrilled when they came out with Rio 2. We love family movie and game night in our family. We normally do it on Sunday evenings. That table setup is awesome! So fun for the kids! We haven’t watched the movie yet but we’ve heard great things about it. GIRL, I will take Mother Of The Year accolades anytime! LOL!!! I’ll keep that in mind while I’m totally engrossed in work the next few days! Love this! What a great way for the kids to come together,have fun and relax. So fun – it looks like you had a great time. What a lovely family! Love this! Looks like the kids had a blast! They did. In fact when it was over they wanted yo watch it AGAIN! 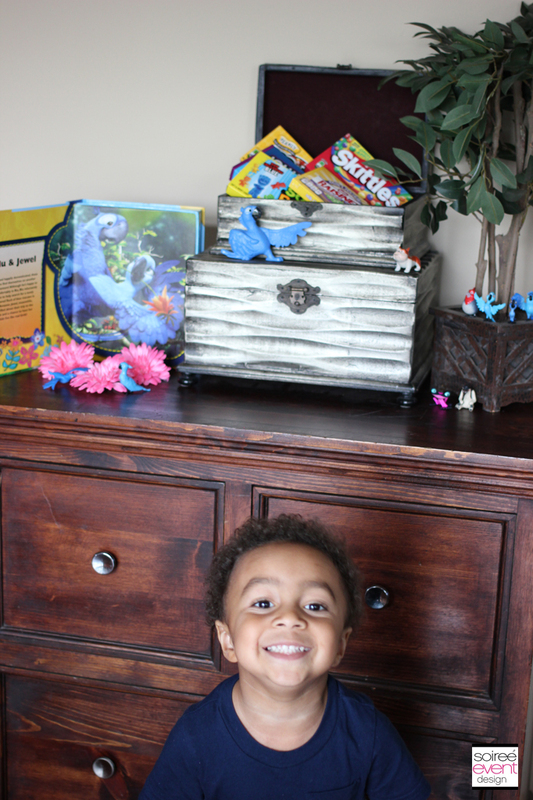 YAY for bringing back family movie night with tons of fun ideas! How fun! Great job Tonya. This is something that is easy enough for everyone to do! Yes! That’s what I was going for! Let me know how they like it! 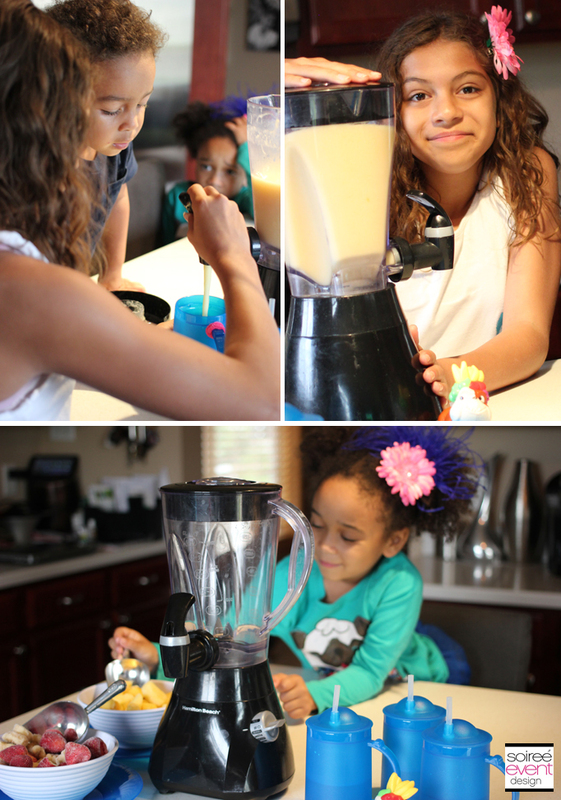 My kids felt so grown up making their own smoothies!!! 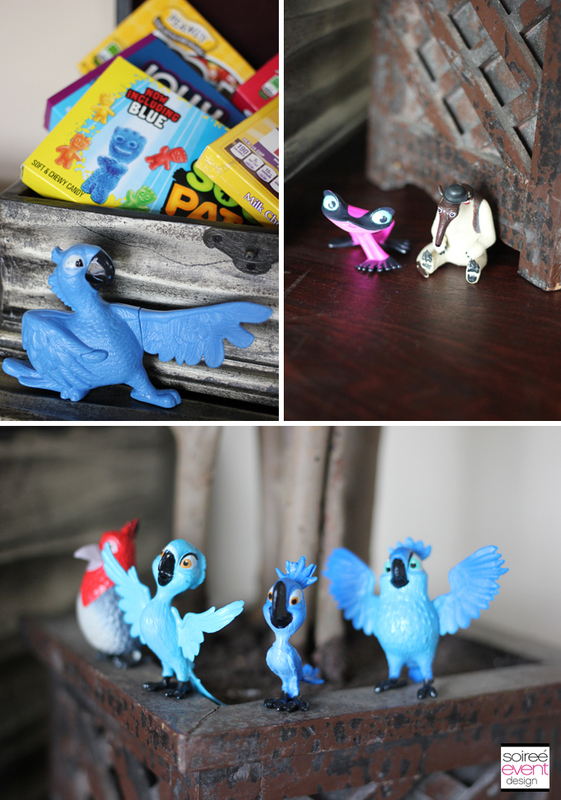 We love Rio 2! Such a fun movie to celebrate Fun Friday!! Cute idea and great set up! Ooooh, I love that smoothie idea and the idea of getting one of those movie theater-looking popcorn machines and just putting microwave popcorn in it. I wanna do that! Sounds and looks like a blast! Rio is one of our favs! Swooning over your daughter’s dress. Beautiful! Yay for family movie nights! This looks so fun! We saw it at the theater and it was cute! Sounds like a great party! My kids love this movie! Looks like your kids did too! How fun! We still haven’t seen this movie yet. I need to get on that. That looks like so much fun! I’ll have to watch that movie with my son. My boys love Rio. I know this was an awesome party. Your kids are beautiful! What an awesome set of pictures! My kids love this colorful movie too!! What a fun night with your family! 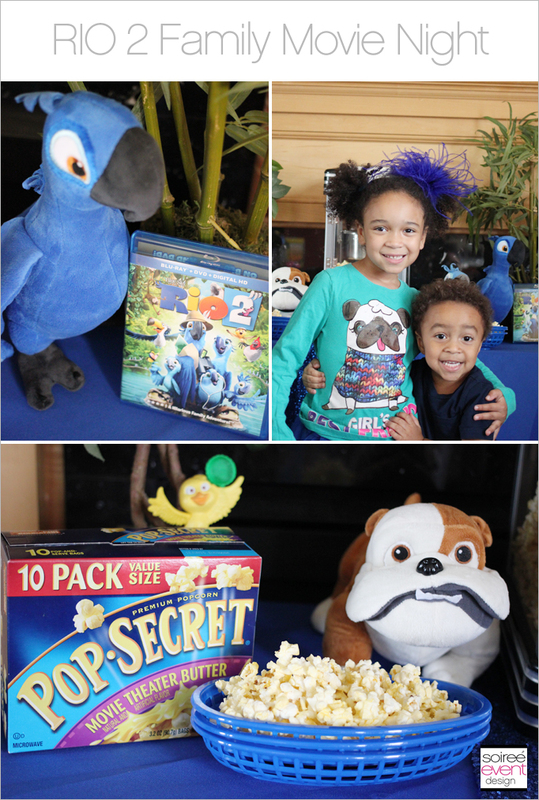 I love popcorn parties along with a great movie like Rio 2. We saw it in the theater and loved it. What a fun setup! Your kids are adorable! My kids and I can’t wait to see this! It is great fun to watch a movie at home with all the theme clothes, decorations and toys.